Boat fire in Bokeelia on January 18, 2019. 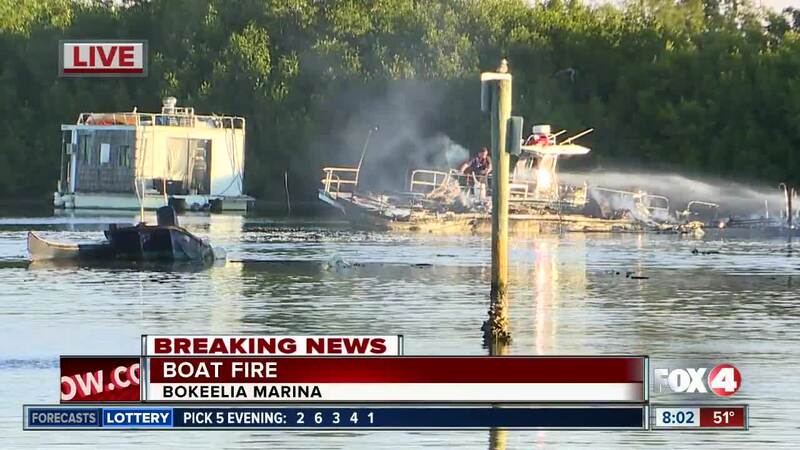 BOKEELIA, Fla. -- Fire crews responded to a boat fire Friday morning that left a houseboat totally destroyed. The calls came in just before 7 a.m. from Jug Creek in the area near Porto Bello Street in the community of Bokeelia, on the north end of Pine Island. Neighbors tell Fox 4 that they heard two explosions during the fire, which burned the boat down to the waterline. They said a man named Kevin lived about the boat, and they hope he got out safely. Another smaller boat also appears to have burned nearby. More updates to come in this developing story.